Lack of goals has been a concern for the side from the capital who have had to rely on young Lallianzuala Chhangte upfront. Delhi Dynamos players at a training session in Jamshedpur on Tuesday. 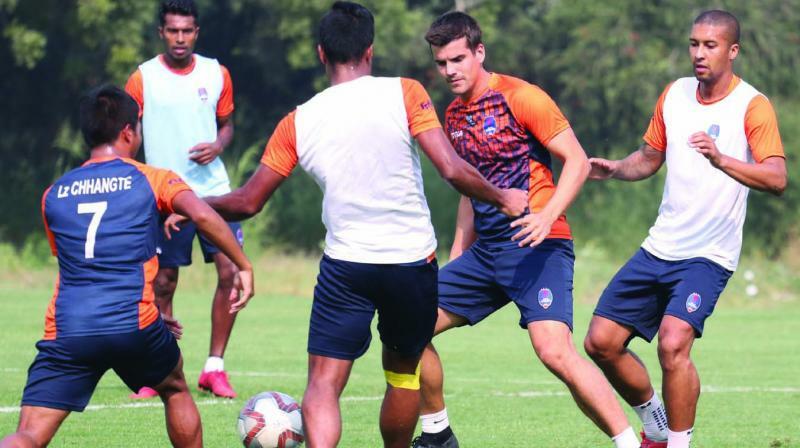 New Delhi: Delhi Dynamos take on hosts Jamshedpur FC in their penultimate match of the Indian Super League Season 5, before the long international break, at the JRD Tata Sports Complex on Wednesday. Winless Dynamos will be eyeing their first three points of the season while Jamshedpur FC are in desperate need of a win as well if they want to keep their playoff hopes alive. Dynamos head into this game after squandering a half-time lead against Mumbai City FC at home in their last match, which they lost 2-4. Lack of goals has been a concern for the side from the capital who have had to rely on young Lallianzuala Chhangte upfront. The winger has scored three times this season so far, including one against the opponents the last time these two sides met earlier in the season. Josep Gombau’s men have played attractive football but it hasn’t paid dividends as they have struggled to finish their chances as striker Andrija Kaluderovic has scored just once so far while Daniel Lahlimpuia is yet to bag a goal this season. The side showed great positivity against FC Goa and Bengaluru FC in their last few matches but, in the end, ended up on the losing side despite being in a winable position. “Tomorrow’s game will be an equal game. The last time we faced them it was a great match where both teams attacked. It will be a good goal scoring match,” Gombau said. “If you see the games, we have missed a lot of chances and that has hurt us the most. Missed chances have built pressure and because of that we are conceding late,” he added. Jamshedpur FC meanwhile have won just one of their last 5, drawing three and losing one. The side come into this game without the suspended Gourav Mukhi and the injured trio of Raju Gaikwad, Sergio Cidoncha, Michael Soosairaj.